To be known as Leeds City Village, the scheme plans to deliver over 1,000 new homes as well as a mix of commercial, leisure and amenity space. Situated at the former Marsh Lane Goods Yard it will incorporate a series of new buildings set within new areas of public realm and landscaped spaces. 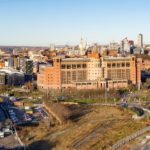 The Rushbond Group, an award-winning Leeds-based real estate investor and developer, has come together with residential development specialist Gold and Amber, to bring forward the regeneration of this major development site.